Prime Minister Lee Hsien Loong's National Day Rally speech not only hit notes of humility and sincerity, its positive reception was reinforced by his indications that some long sought-after policy adjustments, such as paternity leave, would be finally forthcoming. This willingness to shift was underscored by the announcement of a national conversation. This is intended to feed input to the general review of policies to be headed by Minister Heng Swee Kiat. Such a step signals a new "co-creative" model of policy making. For such a model to work, Singaporeans must play their part. It begins with participation. As one cliche goes, "decisions are made by those who show up". Today, "showing up" can be done virtually as well as physically. However, participation alone is an insufficient threshold to ensure that this experiment succeeds. It is critical that the signal-to-noise ratio in communication is well managed. If not, we will have to make sense of a cacophonous crowd rather than a sonorous symphony. There are three requirements for this to be done well. First, filters to separate picture from static. This should be the responsibility, not only of the Government but also community and civic leaders as well as responsible social media activists. Filters are needed to mediate the process of engagement and help sense of the emergent narrative. Second, Singaporeans need to educate themselves on the issues and perceive them not through the monocle of self-interest, but with a binocular lens which balances self-interest with the larger considerations of community and nation. The focal length of these lenses must be sensitivity to the longer-term, not merely immediate preoccupations. Third, we need to manage our emotions in this national conversation. There is considerable pent-up passion behind the varied grievances of Singaporeans. That emotional energy will need to be managed with maturity by all. Emotion can be valid justification for a point of view. But emotion is not a good process with which to deal with it. Input should be thought through and presented soberly, with due consideration and respect to differences of view. The Prime Minister also had a sober message about being open to change. He alluded to how radically things had changed over the past 20 years, and cast forward to how different things could be in 20 years hence. In so doing, he signalled a transition in the Government's perspective: From one that viewed society as complicated, to one which views it as complex. Let me explain. Complicated systems are those which may have many moving parts, but which all function together in a predictable manner - like a mechanical watch. A part of the frustration felt by Singaporeans in recent years was the sense that the Government acted as watchmakers, maintaining a society they treated as nothing more than a complicated precision watch in need of occasional tuning. A complex system, such as a society, is one in which all the constituent entities are interdependent and interconnected. What one entity does creates ripple effects affecting all others and in difficult to predict ways. Vitally, unlike complicated systems, complex ones are capable of adaptation. Complex systems can be unpredictable and can eventuate in large outcomes, such as financial meltdowns. This unpredictability does not mean that complex systems cannot be somehow managed. It just means that managing it is a much more involved process than that of a watchmaker tuning a watch. In a complex system, the watch tends to have a mind of its own. Poorly adapting complex systems not only throw up negative large-scale events but also respond badly to shocks. Conversely, a complex system that exhibits adaptive resilience thrives despite shocks, sometimes even because of them. The societies which possess adaptive resilience have confidence in their identities. Is Singapore a poor or resilient adaptive complex system? Our own history is strong indication that we are good at adaptation. We have thrived through tumultuous change. Just because we are getting even more complex, does not mean that we cannot match up to the higher ante of adaptation required. The moral compass of the nation lies within each of us, magnetised by the warmth of shared values and not steered from the outside by the grim iron of economic numbers. Knowing this, we need not fear losing ourselves even as the frequency and amplitude of change increase. This conviction must be of a shared attitude of mind and a spirit of heart. It should not require a government department to cultivate; it must be an autonomously activated, self-sustaining chain reaction of positive energy. It must be real, not manufactured. To facilitate this, we have to have more trust that people have the intelligence and maturity to be self-regulating in their social and political conduct. Not all will live up to this standard, but the deficiencies of a few should not be determinant of the standard for all. This trust needs to be both between government and people, and among the different constituencies of people within the community. Successful adaptation does not mean that every challenge can be defeated. It means also learning to come to terms with changes which cannot be avoided. During the process of the national conversation, we should be prepared to make some reality checks on our expectations of just what can change and what cannot. First, it is our lot in life to be a geographically limited country. The implication is that density of urban environment can only continue to intensify. No amount of conversation will change that. But coming to terms can be a positive process of self-awareness of the things that matter more, over the things that matter less. In other words, we work on the things we can change, such as building our social harmony amidst the density, and fret less about the things we cannot, which is the density itself. Second, we are an ageing society and that is a persistent driving force of social change. While some may be resistant to the placing of aged centres near them now, they will likely change their minds when they themselves are turning aged. Realistically, with ageing being so pervasive, we face a future where infrastructure for the aged will permeate every part of the community. Introducing this infrastructure progressively allows us to stay slightly ahead of demand. Third, we are becoming more diverse. As Shakespeare has Hamlet observe, "there is nothing that is either good or bad but thinking makes it so". I suspect that adjusting to this new reality of social diversity will be the greatest test for most Singaporeans. Fourth, our existing public infrastructure is ageing. The MRT and the main highways are now some 25 or more years old. We have the means to recapitalise and extend them. The occasional failure is, on the grand scale of things, a blip not a bomb. So let us take a deep breath and cut ourselves some slack even while insisting, justifiably, on high standards. Cutting slack simply means not over-interpreting the meaning of occasional failures and consequently growing despondent that we are systemically decaying. Fifth, and most importantly, let us mature to accept that the Government is not our parent and the people are not its children. To expect the national conversation to be a binary one, where complaints flow in one direction and solutions flow from the other, is naive and self-defeating. For the experiment of co-creation to work, solutions have to come from the community and individuals as well as the Government. Complex systems are capable of the phenomena of emergence. This is where macro reality is created by, but is distinct from, the action of the micro activity. The wonder that is consciousness, generated from the chemistry of neural activity, is an example. Similarly, the new narrative for Singapore will emerge from the activity of a multitude of conversations, iterations of discussions, resolutions of tensions and, yes, even clash of ideas. We should be willing but patient enough to see this process through. The future is not certain. We are not in full control of events and some driving forces of change are fixed. What is flexible is our attitude towards these driving forces. We may not be able to fully recognise our future before it is here, but we can do much to make it the way we want it to appear. We can give deliberate attention to the things we can control and take ownership of the process by which we do so. We already have a good start. We have a leader who has the wisdom to know that it is better to change while we can, and not when we must, and the courage to acknowledge that the need for change applies to himself and his team as much as it does to the people and the nation. Devadas Krishnadas is Director and Principal Consultant for Future-Moves, a foresight consultancy. He has extensive policy and operational experience in Singapore's public sector. Autism - Father's contribution; Autoimmune Disorder? The findings also counter the longstanding assumption that the age of the mother is the most important factor in determining the odds of a child having developmental problems. The risk of chromosomal abnormalities, like Down syndrome, increases for older mothers, but when it comes to some complex developmental and psychiatric problems, the lion’s share of the genetic risk originates in the sperm, not the egg, the study found. Previous studies had strongly suggested as much, including an analysis published in April that found that this risk was higher at age 35 than 25 and crept up with age. The new report quantifies that risk for the first time, calculating how much it accumulates each year. The new investigation, led by the Icelandic firm Decode Genetics, analyzed genetic material taken from blood samples of 78 parent-child trios, focusing on families in which parents with no signs of a mental disorder gave birth to a child who developed autism or schizophrenia. This approach allows scientists to isolate brand-new mutations in the genes of the child that were not present in the parents. Most people have many of these so-called de novo mutations, which occur spontaneously at or near conception, and most of them are harmless. But studies suggest that there are several such changes that can sharply increase the risk for autism and possibly schizophrenia — and the more a child has, the more likely he or she is by chance to have one of these rare, disabling ones. Some difference between the paternal and maternal side is to be expected. Sperm cells divide every 15 days or so, whereas egg cells are relatively stable, and continual copying inevitably leads to errors, in DNA as in life. Dr. Stefansson’s co-authors included C. Augustine Kong of Decode, and researchers from the University of Iceland, Aarhus University in Denmark and Illumina Cambridge Ltd.
Dr. Stefansson said it made sense that de novo mutations would play a significant role in brain disorders. At least 50 percent of active genes play a role in neural development, so that random glitches are more likely to affect the brain than other organs, which have less exposure. In the end, these kinds of mutations may account for 20 to 30 percent of cases of autism, and perhaps schizophrenia, some experts said. The remainder is probably a result of inherited genetic predisposition and environmental factors that are the subjects of numerous studies. Dr. Stefansson and other experts said that an increase in the average age of fathers had most likely led to more cases of autism. Unlike other theories proposed to explain the increase, like vaccinations, it is backed by evidence that scientists agree is solid. This by itself hardly explains the overall increase in diagnoses, at least in the United States. The birthrate of fathers age 40 and older has increased by more than 30 percent since 1980, according to government figures, but the diagnosis rate has jumped tenfold, to 1 in 88 8-year-olds. And it is not clear whether the rate of schizophrenia diagnosis has increased at all in that time. IN recent years, scientists have made extraordinary advances in understanding the causes of autism, now estimated to afflict 1 in 88 children. But remarkably little of this understanding has percolated into popular awareness, which often remains fixated on vaccines. So here’s the short of it: At least a subset of autism — perhaps one-third, and very likely more — looks like a type of inflammatory disease. And it begins in the womb. It starts with what scientists call immune dysregulation. Ideally, your immune system should operate like an enlightened action hero, meting out inflammation precisely, accurately and with deadly force when necessary, but then quickly returning to a Zen-like calm. Doing so requires an optimal balance of pro- and anti-inflammatory muscle. These findings are important for many reasons, but perhaps the most noteworthy is that they provide evidence of an abnormal, continuing biological process. That means that there is finally a therapeutic target for a disorder defined by behavioral criteria like social impairments, difficulty communicating and repetitive behaviors. But how to address it, and where to begin? That question has led scientists to the womb. A population-wide study from Denmark spanning two decades of births indicates that infection during pregnancy increases the risk of autism in the child. Hospitalization for a viral infection, like the flu, during the first trimester of pregnancy triples the odds. Bacterial infection, including of the urinary tract, during the second trimester increases chances by 40 percent. The lesson here isn’t necessarily that viruses and bacteria directly damage the fetus. Rather, the mother’s attempt to repel invaders — her inflammatory response — seems at fault. Research by Paul Patterson, an expert in neuroimmunity at Caltech, demonstrates this important principle. Inflaming pregnant mice artificially — without a living infective agent — prompts behavioral problems in the young. In this model, autism results from collateral damage. It’s an unintended consequence of self-defense during pregnancy. Yet to blame infections for the autism epidemic is folly. First, in the broadest sense, the epidemiology doesn’t jibe. Leo Kanner first described infantile autism in 1943. Diagnoses have increased tenfold, although a careful assessment suggests that the true increase in incidences is less than half that. But in that same period, viral and bacterial infections have generally declined. By many measures, we’re more infection-free than ever before in human history. In some cases, scientists even see a misguided immune response in action. Mothers of autistic children often have unique antibodies that bind to fetal brain proteins. A few years back, scientists at the MIND Institute, a research center for neurodevelopmental disorders at the University of California, Davis, injected these antibodies into pregnant macaques. (Control animals got antibodies from mothers of typical children.) Animals whose mothers received “autistic” antibodies displayed repetitive behavior. They had trouble socializing with others in the troop. In this model, autism results from an attack on the developing fetus. But there are still other paths to the disorder. A mother’s diagnosis of asthma or allergies during the second trimester of pregnancy increases her child’s risk of autism. So does metabolic syndrome, a disorder associated with insulin resistance, obesity and, crucially, low-grade inflammation. The theme here is maternal immune dysregulation. Earlier this year, scientists presented direct evidence of this prenatal imbalance. Amniotic fluid collected from Danish newborns who later developed autism looked mildly inflamed. Debate swirls around the reality of the autism phenomenon, and rightly so. Diagnostic criteria have changed repeatedly, and awareness has increased. How much — if any — of the “autism epidemic” is real, how much artifact? YET when you consider that, as a whole, diseases of immune dysregulation have increased in the past 60 years — and that these disorders are linked to autism — the question seems a little moot. The better question is: Why are we so prone to inflammatory disorders? What has happened to the modern immune system? There’s a good evolutionary answer to that query, it turns out. Scientists have repeatedly observed that people living in environments that resemble our evolutionary past, full of microbes and parasites, don’t suffer from inflammatory diseases as frequently as we do. Generally, the scientists working on autism and inflammation aren’t aware of this — or if they are, they don’t let on. But Kevin Becker, a geneticist at the National Institutes of Health, has pointed out that asthma and autism follow similar epidemiological patterns. They’re both more common in urban areas than rural; firstborns seem to be at greater risk; they disproportionately afflict young boys. More recently, William Parker at Duke University has chimed in. He’s not, by training, an autism expert. But his work focuses on the immune system and its role in biology and disease, so he’s particularly qualified to point out the following: the immune system we consider normal is actually an evolutionary aberration. Some years back, he began comparing wild sewer rats with clean lab rats. They were, in his words, “completely different organisms.” Wild rats tightly controlled inflammation. Not so the lab rats. Why? The wild rodents were rife with parasites. Parasites are famous for limiting inflammation. What does stopping the insanity entail? Fix the maternal dysregulation, and you’ve most likely prevented autism. That’s the lesson from rodent experiments. In one, Swiss scientists created a lineage of mice with a genetically reinforced anti-inflammatory signal. Then the scientists inflamed the pregnant mice. The babies emerged fine — no behavioral problems. The take-away: Control inflammation during pregnancy, and it won’t interfere with fetal brain development. For people, a drug that’s safe for use during pregnancy may help. A probiotic, many of which have anti-inflammatory properties, may also be of benefit. Not coincidentally, asthma researchers are arriving at similar conclusions; prevention of the lung disease will begin with the pregnant woman. Dr. Parker has more radical ideas: pre-emptive restoration of “domesticated” parasites in everybody — worms developed solely for the purpose of correcting the wayward, postmodern immune system. Practically speaking, this seems beyond improbable. And yet, a trial is under way at the Montefiore Medical Center and the Albert Einstein College of Medicine testing a medicalized parasite called Trichuris suis in autistic adults. First used medically to treat inflammatory bowel disease, the whipworm, which is native to pigs, has anecdotally shown benefit in autistic children. And really, if you spend enough time wading through the science, Dr. Parker’s idea — an ecosystem restoration project, essentially — not only fails to seem outrageous, but also seems inevitable. Since time immemorial, a very specific community of organisms — microbes, parasites, some viruses — has aggregated to form the human superorganism. Mounds of evidence suggest that our immune system anticipates these inputs and that, when they go missing, the organism comes unhinged. Future doctors will need to correct the postmodern tendency toward immune dysregulation. Evolution has provided us with a road map: the original accretion pattern of the superorganism. Preventive medicine will need, by strange necessity, to emulate the patterns from deep in our past. Mr Lee Kuan Yew recently commented that Singapore would "fold up" if we did not raise the birth rate. Mr Lee's remarks were made against the backdrop of an announcement that the Government would conduct another review of the Marriage and Procreation policy. First off, whatever value judgments Singaporeans may make about his interpretation, no one can argue with the demographic facts. We do have an abysmal birth rate, consequently we are dependent on population augmentation, and this does have undesirable and uncomfortable consequences; but if we do not reverse the first and if we reject the second, we will face population decline within a generation. There should be no dispute here. Predictably, however, Mr Lee's point of view provoked a volley of comments from Singaporeans. I have categorised the protestations into three buckets. The first bucket contains two strands of criticisms. One, that the Government is being hypocritical because of the culpability of its "stop at two" policy in causing the low birth rates. Proponents of this view do not dispute the legitimacy of the argument that the birth rate needs to increase, but absolve themselves of the responsibility of doing anything about it because they view themselves as victims of a past policy decision. The second criticism is that the Government's emphasis on growth has shaped a mental model of prioritising careers over family. The proponents of this school of thinking are convinced that if the Government reduces the priority it places on economic growth, the problem would remedy itself over time. The second bucket is made up of the interesting critique that the exhortation to increase the birth rate constitutes an intrusion into the private space of individuals. Quite rightly, birth is an intimate and personal decision. But it is a logical stretch to use this truism as a basis to detect an authoritarian intent to conscript the bodies of women to the national cause. This school of thinking perceives the case for individual autonomy as trumping any call for collective burden sharing. Although not fully embracing the idea of population augmentation, the proponents of this view, by logical default, accept it as a necessary evil. While not offering any solutions, this view does move the discussion beyond finger pointing to the tensions between individual choice and national interest. The third bucket of criticism is from those who feel that high costs and inequality are the impediments to procreation. They call for a more redistributive social model as a response, not only to falling birth rates but also to close the inequality gap. The virtuous amongst this group even preemptively volunteer to pay higher taxes. Only proponents of this perspective recognise the systemic nature of the problem and propose a systemic response. Now let us take a closer look at these buckets. I think of the first bucket as the "You" people. "You", because their criticisms typically commence with that word, meaning the Government or some Minister of the same. However sincere the motivating angst, there are several problems with the case of the "You" people. First, even if and where policy was misjudged, was there malicious intent and what effect did the policy really have? The "stop at two" policy was driven out of a fear that the population was growing faster than economically viable. It reflects the sober and conservative expectations for future economic performance in the midst of the global economic shocks of the 1970s. It is hardly fair to indict past decision makers with the benefit of 20-20 hindsight. Did the policy makers in the past miscalculate? Perhaps, but not in the way the "you" people think. A close study of the correlations between our birth rates and level of economic development reveals that we followed a well-established pattern of inverse correlation. In other words, even without the "stop at two" policy, we should have expected to see the birth rate fall as it did, as we became more affluent and our people, particularly women, became better educated. So the argument for policy hypocrisy is debatable. Second, the view that the emphasis on growth is a major causation is a weak argument. It is too much to suggest that an economy of our size and nature can function independently of global economic events. Quite the opposite, we are almost wholly dependent on these events to dictate our economic performance. Further, this bucket presents a too simplistic picture which casts the Government in the role of the antagonist while the people are cast as helpless victims absolved of responsibility for their future. Perhaps the most limiting quality of this bucket is that it offers no ideas on what to do next. So while the "you" bucket makes the most noise in social media, it is probably because it conforms to the old axiom about empty vessels. The "I" people, in the second bucket, think about themselves as almost wholly distinct from the collective. Admittedly, the tension point between individual and the collective space would seem an important determination. But while no one can deny that the decision to procreate is a personal one, this does not make it mutually exclusive with a discussion of aggregate procreation. The State cannot force the individual course in the matter of procreation. What is clear, after more than a decade of affirmative policy action, is that promoting procreation with targeted policies has proved to be spectacularly ineffective. We have also reason to suspect that the targeted policies to limit procreation were probably less effectual than is commonly assumed. The third bucket is composed of the "Us" people, those who believe in social models having determinative power over individual action. Of all the buckets, only the "Us" people think in system terms. Their main idea is that a different social safety net model would influence personal behaviour. There have been many eloquent advocates in favour of changing to a "Nordic" model characterised by higher taxation, a more interventionist and deliberate redistributive model and greater State presence in the social space. The motivations for promoting such advocacy range from a desire for less inequality, more inclusiveness and belief that if the costs of child rearing were socialised, then the individual proclivities could be positively influenced in favour of procreation. The problem is that we will never know for sure whether moving in this direction will work until we try it. But trying it has a very long tail, for we will need at least a generation to judge the effects. The fiscal costs of the "Nordic" model should not be underestimated. But neither should these cost projections be considered sufficient argument not to go in this direction. The matter is ultimately not one of whether we can afford it, but whether we want to afford it. What is required is a deliberate, protracted and participatory discussion as to the full meaning and potential implications of such a systemic move. Given the importance of the issue, the conversation should take place over a substantial period of public and parliamentary debate which should include as many voices as possible. The general public and civic groups should activate themselves to participate as stakeholders in Singapore society. There need not be a rush to consensus, we should take the time to get this right. We need to move the debate forward, and out of the state of policy stasis. All parties should be open to possible different futures. How do we do this? Second: Distinguish between the fatuous and the fair criticisms. Third: Recognise that targeted policies have not worked, thus leaving us with the implication that only a systemic adjustment would be of the scale and dimension to match the nature of the problem. Fourth: Accept that individual choices have a collectivised expression, but also that a collectivised decision may well ultimately stand the best chance of influencing individual choice. Fifth: The process of arriving at a decision on a social model is important to the legitimacy of that decision. And by social model, I mean more than a system of redistribution but also a reconsideration of traditional notions of family and the legitimacy of single mothers. A mark of social maturity is the acceptance that while one may not adopt, or even approve, a social choice, this does not give us the right to deny that choice to another. It is an unsettling truth that we will not, for a long time, be certain of the outcome of any decision to change. But this should be contrasted with the more disturbing certainty of knowing the result of continuing as we are. We need to enter into a national conversation about the kind of future we want, and commit ourselves to the price to be paid for the choice that we as a people make, and which the Government then should implement, not the other way around. Devadas Krishnadas is Director and Principal Consultant for Future-Moves, a foresight consultancy. He has extensive policy and operational public sector experience in Singapore and, as a Fulbright Scholar, read for a Masters of Law and Diplomacy at the Fletcher School, Tufts University. SYDNEY - After living alone on a remote tropical island for almost 20 years accompanied only by his dog Quasi, David Glasheen is usually referred to as the Australian Robinson Crusoe. Since losing his fortune in the 1987 stock market crash, Mr Glasheen, now in his late 60s, has lived off fish, crab, bananas and coconuts. He grows his own vegetables and brews his own beer. "I am contented and happy, and in the modern-day world that's a precious thing," he has said. But his days of solitary idyll may be over. An Australian court has ruled that Mr Glasheen must leave the island. The latest court order is one of several key differences between Mr Glasheen and his literary forebear. Mr Glasheen has encountered no native cannibals, though he has been visited by yachtsmen and kayakers passing his small island in the Great Barrier Reef, about 2,000km north of Brisbane. And Mr Glasheen has not yet found a companion - a "Friday" - though he did make international headlines several years ago by placing an advertisement on an online dating agency. "It gets lonely out here," he told a reporter at the time. "My only hope is for a mermaid to turn up on the beach." The long-haired frequently bare-chested isolato, who has access to a solar-powered Internet connection, received hundreds of responses. Sadly, he had no luck. "Half of them were crazy," he said. Finally, unlike Crusoe, Mr Glasheen was not shipwrecked and is in no hurry to escape. He decided to move from Sydney to the 40ha Restoration Island in 1993 after losing A$10 million (S$13.1 million) in a single day of share trading and then losing his marriage and his homes. He initially moved to the island with a girlfriend, but she found life there too difficult and left. He still receives visits from his son and still flutters on the stock market using an online trading account. But he shows no regret for his decision to leave behind his fast-paced city life. "I was in the office before my children woke up and I was home when they were asleep," he told an Australian reporter in 2009. Mr Glasheen said he revels in the tranquillity and privacy and has described himself as "the luckiest bloke in the world". "I suppose I am a hermit, just because I live here on my own," he said last year. "I see myself as a social hermit, and I've played host to all sorts of interesting people from all over the world here." The former businessman and a business partner had been subleased 15ha of public land on the island on condition that he build a resort. According to a 43-year lease which commenced in 1996, he is supposed to develop tourist accommodation and fishing facilities valued at least A$200,000. But the Queensland Supreme Court has ruled that he has not taken steps to develop the resort and that the land should be repossessed. On his website, Mr Glasheen claims he has received approvals to develop a resort and invites investors interested in funding a project which could include private guesthouses and a health spa. "There is nothing more exclusive and sought after in the world than having your own private island," says the website. But with no resort in sight, the court ruled that Mr Glasheen and his business partners were "trespassers". "The development was never materially advanced beyond the preparation and planning stage," the court said. "The defendants have wrongly deprived the plaintiff of its asset for over a decade during which time they have enjoyed its benefits." How should the Government handle rumours? speculation spread so virulently, quickly and widely. megaphone that amplifies rumours exponentially. of times, and commented on excitedly. withhold important information for expediency. with the new media as an accomplice. these rumours and create panic." rumour about Mr Lee's health? is "it must be true". of response - not necessarily an official one - was merited? should be nipped in the bud. was slammed by netizens for what he quickly admitted was a hoax. Government's social media strategy should have come into play? in its tracks. Instead, the silence fuelled the speculation. April 9 - were made months earlier in response to the rumour mill then. Chuan-Jin, only alluded to the rumours after the event. rumours, then people may think something is amiss." on Facebook. Such a subtle note would be better". what form", as Mr Tan put it. control and spilling over into real actions. "For example, race and religious issues," said Mr Tan. is as it seems, and the spirit of discernment is critical." Hopefully, the education process - on both sides - is underway, thanks to an episode that will serve as a cautionary tale. questions that cast serious doubt on the case. acquittal, if the defence had been allowed to address them properly. mental illness did not affect criminal intent? Heywood, who wrote to Gu's son, Mr Bo Guagua: "You will be destroyed." But by then, her son was already in the United States, studying at Harvard. carried that blood sample home without permission. the amount of which was, by coincidence, just enough to kill a person. safeguarded during that four-month period? that he was actually still alive when Gu left the room. defence lawyer have a chance to question key witnesses during the trial? There was no explicit mention of Gu's husband in the indictment. estate deals in Chongqing and in France. There were no explanations of what the projects were, why the deal failed and what Mr Heywood's role was. the government-controlled media that he was a corrupt official? render guilty by association and destroy for good. the two, perhaps the murder charge seemed the better deal. get her potential death sentence commuted. possibility of a comeback when the political winds shift. outliving most of his foes. take the case seriously or at least attempt to honour due process. by the legal system without any media attention. leadership transition at the 18th Party Congress later this year. case. This essay was translated by Wenguang Huang from the Chinese. WHEN you are growing up, you are told a series of well-intentioned lies. "You can be anything you want to be" being the biggest porky. The jet-setting cosmopolitan child is also lied to. "You are a citizen of the world," he or she hears. I found out very quickly that you are a citizen of two or three places at most - the country you have the fortune (or lack thereof) to be born in, and the ones that you choose for yourself if you're lucky. Last year, I chose Singapore and six months after my citizenship application, Singapore chose me back. The first time I thought seriously about becoming a Singaporean was five years ago. A permanent resident then, I was watching a local news bulletin with the growing fascination people reserve for train wrecks. If memory serves me right, some outraged residents of an estate had found that roadworks nearby were causing cracks in their driveway tiles. A female resident said: "The rainwater is pooling in the cracks and my maid might get bitten by mosquitoes when she's washing my car and get dengue," or something to that effect. I'd thought, by gum, I want to be this lady. I want her First- World problems and maybe-dengue. Where I'm from, people simply have problems and actual dengue. I would not insult anyone with a spiel about how this is the Greatest Country on Earth. Countries like America have genuinely believed that and look what's happened. Singapore, like any other country, is not for everyone. I have honestly never seen a nation of people more hard on itself despite achievements of dazzling proportions against the worst of odds. After a look at Gardens by the Bay - one of the most spectacular feats of planning and thoughtfulness I have seen - a friend asked me with the furrowed-brow earnestness only a local could muster: "Do you think it's too contrived?" Singapore is the Woody Allen of nations - simultaneously brilliant and self-flagellating about not being brilliant enough. Singapore is also like the father in the High Expectations Asian Father meme who says things like, "B is for Burger King... where you are going to work for the rest of your life" and "You are the 99 per cent? Why not 100 per cent?" I say this with the utmost of affection. In fact, these national quirks are why I am now a Singaporean. For once we stop complaining about the smallest of things and sending our five-year-olds to two kindergartens at once, we will become... Europe. When Orchard Road flooded last year, national outrage abounded but where I was born, you don't need rain to wipe out years of industry. The house of your existence, built painstakingly by hard work, artful dodging of the law and gritted teeth, can be washed away overnight by the caprice of someone powerful, greedy or stupid. Over here, the refrain when anything goes wrong is: "How could the Government let this happen?" while in almost everywhere else, the government is something that happens to you if you're unlucky. You could enter a building through the door for questioning but leave via the window, under a white sheet. I came to Singapore nine years ago. Since then, people have given me scholarships, written me letters of recommendation and let me do a job that I love. They saw me not as competition but as someone in need of the opportunities that her home country could not or would not give her, and for that I am eternally grateful. It is a lie that you are a citizen of the world. You are a citizen of the country from which your space has been gradually chiselled and negotiated with the other people who share it. With the current zero-sum talk about crowded trains and high property prices, this might seem a daunting feat, but it can be done. We've been doing it for 47 years. This article appeared in The Business Times on Aug 9. Singapore's first individual Olympic medal in 50 years seems to have ignited some sort of national identity crisis. The victorious high over Feng Tianwei's bronze in table-tennis has ebbed rapidly into complex disconcerting topics like what it is to be a real Singaporean. I think it's an equal-opportunity wariness applied to all "new" immigrants. I mean, if Eduardo Saverin invents a better Facebook, no one would really swallow the headline "Singaporean Website Changes Face of Social Media" either. Implicit behind all the hue and cry is perhaps the acknowledgement (admission?) that a born-and-bred Singaporean could not have reached the heights of sporting achievement that Feng did. Maybe it's that - and not the haircut or the accent - that makes her not seem like a real Singaporean because let's face it, this country fits with sporting achievement about as well as it does with cold weather. It's not the small population size that constrains us. Look at Jamaica, with 2.8 million people and 10 medals. Nobody there is going on about how there's not enough talent for two "A" teams. Sporting achievement seems to me to be a function of two things: innate ability and obsessive drive. Assuming that the first is randomly sprinkled throughout the world's population such as albinos and midgets, then it's in the latter where we are falling short. By obsessive drive, I mean the no- childhood, practise 15-hours-day, strict- calorie-control, no-interests-outside-of- sporting-area type of obsessive drive. It is the kind of intense, singular focus that I believe comes only from having no other options. Like a colleague recently observed, ping pong (and diving, gymnastics etc) is to the Chinese what basketball and rap music are to African-Americans: a way out of the ghetto. If you have any sort of sporting talent at all, you latch onto it and you move to training camps and you give up seeing your parents ever again, because if not, what else awaits you? A short, brutish life of tilling the fields or working 15 hours a day assembling electronic devices to provide for the one child you're allowed to bear. That's a crass stereotype, which I mention only to illustrate my point that Singaporeans are just not desperate enough to achieve internationally in sports. Of course, there are top athletes from middle- and upper-class backgrounds. Let's just assume they are either so talented as to make obsessive drive less essential or that they are the exceptions which prove the rule. Say, a Singaporean kid is a really good swimmer. He could forsake a normal life, not have any meaningful relationships except with his coach. He could win an Olympic medal or his career could be over in an instant with an injury, leaving him to be... a PE teacher for the rest of his life. Or, he could just go through the education system, become an accountant, buy an HDB flat, have kids and lead an absolutely normal, wholly pleasant, completely comfortable life. How many of us, coming upon two roads diverging in a yellow wood, would take that first path? With all that sacrifice and all that fragility? And that moment of indecision alone, that awareness that there are other possibilities, other easier lives to live - that alone is impurity in the steel that world-class athletes' minds are cast. As our founding Prime Minister would say, we're just not hungry enough. We could beat ourselves up about it. Or we could put ourselves in the shoes of a North Korean facing the prospect of returning home without a medal and feel kinda relieved. Honestly, we should be true to ourselves and just admit that our hearts are not in this sporting thing. Let's just give everything we have to being incredible at what we are actually good at. We're fantastic at hosting international conventions. We are world-class in building water purification systems. We pretty much have patented the whole Third- World-to-First thing. Footage of these achievements may not be able to play in slow-mo to an inspirational soundtrack, but they are still bona fide ones. So no real Singaporean could win an Olympic medal. That's absolutely fine by me. It doesn't mean we can't still be proud of those who found their obsessive drive elsewhere and are now bearing our flag. When this ping pong thing is over, I wish Feng only the best - by which I mean a uniquely Singaporean, absolutely normal, wholly pleasant, completely comfortable life. In this article, Kyle Spencer explains why China is enamored with SG's economic and political model, but how the Chinese underestimate the task ahead of them of emulating SG (in part if not in whole, and if this is indeed their intent). However, the reasons for China's interest in the Singapore Model makes for a compelling argument for Singapore as an investment interest, and Spencer makes this argument well. Inevitably, there will be conspiracy theorists and Singapore bashers who seem to crawl out of the woodwork and trot out their pet conspiracy theories as to how Singapore succeeded (they need to justify to themselves why their own country is in the shits, despite having more natural resources, despite having more people, despite having more land, despite having history on their side). To hear the most enthusiastic of the pro-Singapore Chinese bureaucrats tell it, the only significant obstacle to adapting the Singapore Model to China is to stamp out corruption, and success will surely follow. What the intelligentsia of the CPC fail to grasp is just how corrupt Singapore isn't. 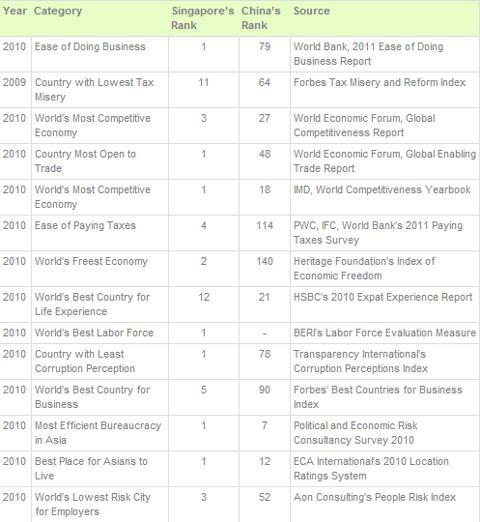 Transparency International ranks Singapore as the fifth least corrupt country in the world. By Singaporean standards, Germany, Japan, the United Kingdom, France and the United States are hopelessly and inexcusably corrupt. China, on the other hand, is the 75th most corrupt nation. That means that China is more corrupt than Italy, about par with Columbia (sic), and only slightly less corrupt than Greece. That's a long way to climb. Singapore also offers protection for intellectual property rights, adhering to the WTO's TRIPS Agreement, the Berne Convention for the Protection of Literary and Artistic Works, and the Paris Convention for the Protection of Industrial Property. China is one of the world's most notorious offenders. 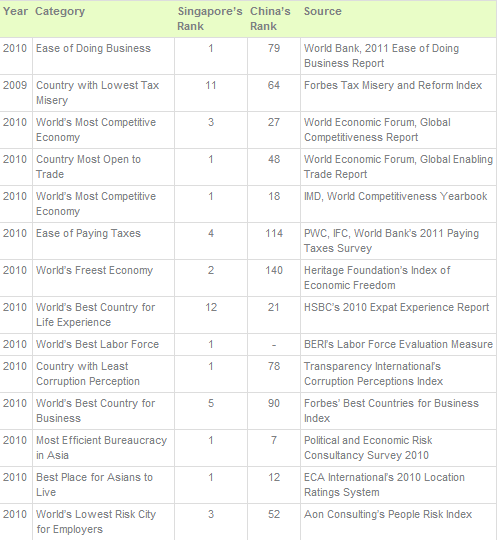 In addition, Singapore holds the highest e-government ranking in the world. It's a matter of corruption chasing Singapore rather than Singapore chasing corruption. "The global financial organization estimates that the amount of assets of Indonesian people in Singapore is S$87 billion, or around Rp506.8 trillion. According to Teten, embezzlers prefer to deposit their funds in Singapore because they feel safe there although the origin of the funds is illegal. The reason for this is that Singapore does not have a Money Laundering Law nor is it yet willing to sign an extradition agreement with Indonesia. Through such an agreement, Indonesia can force Singapore to surrender bad debtors, including return of assets and funds. Teten acknowledged that Indonesians also save funds in Singapore because of other factors, for example business. This is because the business and investment climate in Singapore is very attractive. "In addition, legal certainty is also good, far better compared to in Indonesia," he said." If you're corrupt, you don't want to park your money in a banana republic, because there's no honor among thieves. You'd want the just the opposite: an affluent, bustling international financial center that doesn't ask foreigners inconvenient questions. Singapore is the world's fourth leading financial center, but its success as such isn't built on corruption, it's built on Singapore's maritime supremacy and ease of doing business. Singapore is the world's second-biggest casino gambling market, one of the world's top three oil refining centres, the world's largest oil-rig producer, a major ship-repairer, and a top tourist destination. The port is one of the five busiest ports in the world. Singapore has the world's highest percentage of millionaires, with one out of every six households having at least one million US dollars in disposable wealth. This excludes property, businesses, and luxury goods, which if included would further increase the number of millionaires. As always, due diligence is a must. The article Spencer quoted (and linked) was from Oct 2006. In Dec 2010, SG's Deputy Prime Minister and Defence Minister visited Indonesia and spoke to students of Indonesia's Defence University. One of the question was about the extradition of corrupt officials. 1) Corrupt Indonesians and corruption in Indonesia are an Indonesian problem to be solved by Indonesia. Singapore solved the corruption issue internally. We did not need extradition of corrupt officials, or money laundering laws to be enacted by other countries. Even if such laws and treaties were in place, without addressing the root cause of corruption, it simply means that the fruits of corruption will be channeled elsewhere. 2) Singapore is willing to help and had in fact agreed to an extradition and defence cooperation treaty. Indonesia's parliament has refused to ratify the treaty. 3) Where the Indonesian Courts have made a finding or judgement as to corruption and the funds involved and made a court order, the Singapore authorities have complied with such court orders. THE birth of a child should be a joyous event. Unfortunately, this is not the case for all. Between 2 per cent and 3 per cent of babies born each year in Singapore suffer from some congenital problems. Some conditions, such as a cleft palate or a club foot, merely need some initial treatment for the child to lead a completely normal life. Some others, like some congenital heart diseases, might require lifelong care. The cost, even for a highly subsidised C class patient, can vary from a few hundred dollars to more than $100,000, which most people would find a heavy burden. Everyone appears to agree that parents of such babies, and the people with such problems, should get help. What they disagree on is who should pay. Is this something that society as a whole can help out with, should we all share the burden? Since the subject was raised a few years ago, there have been discussions on whether MediShield, the national health insurance scheme that covers 93 per cent of the population, should cover congenital problems. Those with a strong social conscience, or with personal or family experience of such problems, are vocal in its support. Others, worried about the additional cost to them, argue that asking policy-holders to pay for the treatment of a known problem is unfair to the healthy. Instead, they view insurance as essentially pooling risks for potential problems that all are at equal risk of getting. They argue that it should be the Government's job to look after such unfortunate people. Given the polarisation of views, the idea of extending insurance coverage for neonatal and congenital diseases is clearly not one that the Health Ministry can push through without strong public support. There are at least a few other reasons why some are wary. As is obvious, the need for neonatal care is immediate and congenital problems are usually diagnosed within the first year of birth. As MediShield is an opt-out scheme, there is nothing to stop parents of healthy babies from signing up at birth, and then opting out after the first year when they realise their baby does not need the coverage. The Ministry has calculated that if the parents of children aged up to 20 years are fully behind it, then all each has to pay is an additional $12 a year. This means everyone needs to pay a total of $240 more - over a period of 20 years - to help out. To some, this is part and parcel of being a caring society, to share the burden of paying for treatment for the stricken. Others may view this as a forced subsidy they are unwilling to bear. Such people might decide to drop out of the scheme after a year or so, once they are confident that their child is not suffering from any congenital diseases. If the group that drops out is large, it would push up premiums for those remaining on the scheme, which could lead to a domino effect of even fewer people wanting to be on it. Folk who are willing to pay $240 for coverage their family does not need, might baulk at $480, or more. There is, however, a way out of this dilemma, and that is to load the premiums upfront in the baby's first year, or even better, from before the birth of the child. That is when parents are still uncertain if their child has such diseases, and when they are likely to be willing to fork out the premiums for peace of mind. At that point in time, most parents would be willing to pay high premiums of $200 or even more - especially as it can be taken from their Medisave accounts. This means very little of the cost needs to be spread out among policy-holders up to the age of 20, making it less likely that they would drop out. But the suggestion to cover neonatal and congenital problems with MediShield has another flaw. This basic scheme is pegged at subsidised treatment at a public hospital. But more than half the babies born here are delivered in private hospitals. If the baby is born premature, treatment will have to be at the place where the infant was born. If they are transferred to a public hospital, the child has to be a private patient. A KK Women's and Children's Hospital spokesman said to downgrade to a subsidised ward, the parents have to be means tested. Is the payout from MediShield enough to pay for private treatment? If not, it might defeat the purpose - unless the MOH is willing to change the current rule and allow any infant transferred from a private hospital to enjoy subsidised rates. After several years of discussion, it would be a pity if Singapore is still unable to insure people born with congenital medical problems, or the several thousand born premature each year. The COE system has been in place for more than 20 years and yet the roads are still so crowded. Has it really been effective in controlling congestion? LIKE many other cities, Singapore faces the challenge of managing traffic congestion. Since 1975, the Government has addressed the problem in two ways - pricing road usage and limiting the vehicle population. From 1990, the Government has explicitly limited the number of new car registrations to a monthly quota for Certificates of Entitlement (COEs). At the last auction, the price of COEs (strictly, the COE quota premium) for large cars reached $90,501. COE prices have not been so high since late 1994. The result has been hand-wringing, howls of complaint and a torrent of letters to The Straits Times. Quickly moving to assuage public concerns, Minister of Transport Lui Tuck Yew is talking of tweaking the system to moderate the inflation in COE prices. The latest change is to remove taxis from the bidding process for COEs in the small car category. Instead of bidding, taxis will pay the prevailing quota premium, and the quota will come from the Open category which can be used for any size of cars. Yet, there seems to be little discussion of the more fundamental issue. Just how effective is the COE system in managing traffic congestion?